Bisque: A clay item that has been fired once but is not yet glazed. At this stage, designs may have been painted on, and is ready for either more design or glazing. China Paint: A technique used for the painting of specific small detailed scenes or used as oil paints but on a very small scale. It allows for detailed painting of miniature pictures or scenes. Englobe: Pigment suspended in a viscous medium of liquid clay that when fired turns a specific color. It is used to create designs on ceramics. Glazes: A liquid finish applied after a piece is fired for the first time which gives a waterproof coating to any ceramic piece. It can be shiny, dull, crackled etc. The piece is then fired for a 2nd time to a designated temperature to melt the glaze into the body of the clay. Greenware: Unfired raw, dry clay. It can be easily crushed and is extremely breakable, but most painting is done at this stage. Painted items can appear very dull in color at this stage and sometimes do not appear to be the end color of the finished pot. Heat chemically changes many of the pigments used to create designs. The paints are called "englobes". Mold: A plaster form made from an original "one of a kind" pot that allows an individual item to be more easily reproduced. It lasts for about 25 times or "pulls". They can be one to six pieces that (simply put) are a large plaster jig saw puzzle in 3-D, held together by several 1" wide rubber bands. Slip: Clay in semi-liquid form that is poured into a pre-made plaster mold. 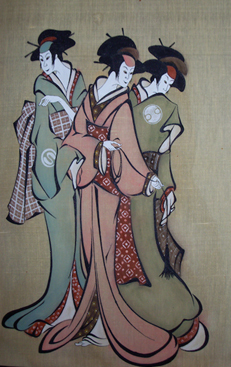 Costume sketch for the "chorus" of Puccini's opera of MADAM BUTTERFLY. Designed and drawn in 1969 in the style of Japanese woodblock masters by Carol Helen Beule.